My Baby Has Watering Eyes and ‘Eye Gunk.’ What Should I Do? When bringing home a beautiful newborn, it can worry new parents to see one or both eyes constantly watering and developing ‘eye gunk.’ This problem is often caused by a clogged tear duct, also called nasolacrimal duct obstruction. Normally, tears are produced all the time to keep our eyes moist and those tears are drained by the nasolacrimal duct. If this duct is obstructed, or clogged, the tears flow out of our eyes causing clear drainage. When tears sit for long periods it can form crusting or ‘gunk’ near the eye and eyelashes. This type of obstruction occurs in around 6 percent of all newborns and is a common topic discussed in our pediatric office. When a pediatrician diagnoses nasolacrimal duct obstruction, we ask parents to massage the area gently several times each day. This technique, called Crigler massage, is thought to help relieve the obstruction and encourage the duct to function normally. The technique is easy to do at home, effective and, best of all, costs nothing. See the video below at the end of this blog demonstrating this technique. We also ask parents to keep the area clean with a soft, damp wash cloth. The good news is that most cases of nasolacrimal duct obstruction go away over time. In fact, approximately 90 percent of all cases will resolve by 6 months of age. After 6 months, there is still a two-thirds chance the problem will resolve, but after 12 months the problem will need treatment by an eye doctor (ophthalmologist). If a child is referred to the ophthalmologist, the treatment usually involves inserting a small probe into the duct to clear the obstruction. Nasolacrimal duct obstruction is not the only reason for an infant to have eye discharge. It is important to speak to your doctor if the eye becomes red, is causing the baby discomfort, has pus-like discharge or the baby has a fever. So if your newborn has a watery eye, talk to your pediatrician. With their help, some gentle massage at home and a bit of patience, the problem will likely go away on its own. 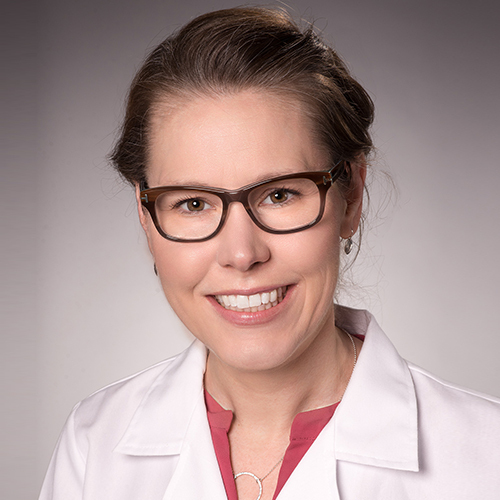 Dr. Bushard is a pediatrician at Cook Children's North Denton pediatrician office location. Dr. Bushard was raised in a large family in rural Northern California. After earning a bachelor’s in biological sciences from California State University, Chico, she joined the​ Human Genome Project effort at Stanford University. There, the world of human genomic study and its potential to improve medical care inspired her to become a doctor. She graduated from Touro University College of Osteopathic Medicine near San Francisco, California then completed pediatric residency training at Advocate Lutheran General Children’s Hospital in Chicago, Illinois. She is board certified by the American Board of Pediatrics and a fellow of the American Academy of Pediatrics. Dr. Bushard has a passion for pediatrics and loves teaming up with families to promote a happy and healthy childhood. Outside of work she enjoys spending time with her physician husband and young daughter as well as reading and exercising. Click here to make an appointment or call 940-241-4724.